Rain Drop, aka JA’s Rain Drop, is a 3 year old red female born June 6, 2014. Her sire is Flupascrackerbox and her dam is JA’s Cloudy Day. Rain Drop has 122 races per greyhound-data.com at Mobile Greyhound Park from July, 2015 to August, 2017. This little lady just wants to go home and relax. Rain Drop is not considered to be cat or small animal tolerant. 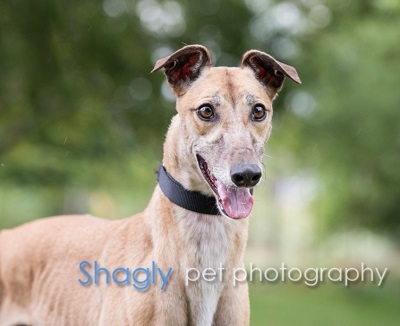 Rain Drop is a sweet, funny, affectionate girl who loves to snuggle. She LOVES any toy she comes across and has great fun tossing them around or arranging them in just the right way. She is really good about letting you know when she needs out and enjoys romping around the yard after she's done her business. She has good house manners – she doesn’t get on furniture or counter surf. She has not shown any food aggression though she definitely enjoys eating. We are still working with her on taking treats directly from our hand and she's learning quickly that is the fastest way to get them. 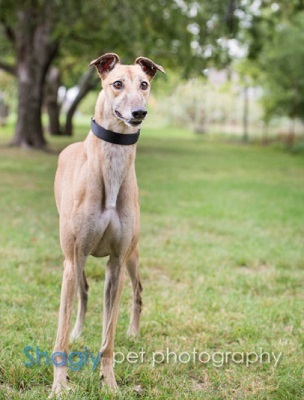 Rain Drop enjoys playing with our greyhounds and loves getting attention from our young boys. She rides well in the car but is still learning how to jump in our SUV. She has no problem jumping out though. Rain Drop has a fairly high prey drive and as such should not live with kitties or small dogs. This beautiful girl will be a wonderful addition to any family. She is learning that being in a home is definitely where she wants to be.